Here it is mid-April in the Twin Cities and winter is still going strong. I’ve been so patiently waiting for signs of spring. But lately it seems like just when enough snow melts for us to see the ground, another round comes in. This past weekend the snow started Friday night, we had blizzard conditions by Saturday afternoon and the snow continued to fall until sometime after midnight last night. I believe we broke some records and got well over a foot of snow. But on the bright side, it was a weekend. So we didn’t have to go anywhere, which left us with plenty of time to just hang out at home and binge watch some Norwegian TV. Mr. Q and I got through all of season 1 and halfway through season 2 of Okkupert (Occupied). Somehow it seemed appropriate to be watching this show while the snow came down. But the weather also gave me a great opportunity to work on some projects. One of the projects I worked on was updating an old wooden ironing board. I’d painted it several years ago with black chalkboard paint and tried to sell it at a couple of my occasional sales, and there just weren’t any takers. So it ended up shoved in the back of the carriage house. Out of sight, out of mind. 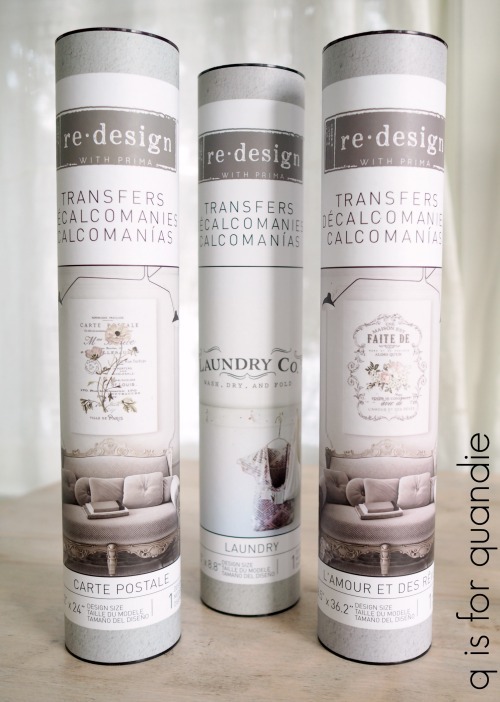 But then Prima Marketing sent me some of their new re.design transfers including the design called ‘Laundry’ (in the middle). It was the perfect size to add to the old ironing board and turn it into a sign. I started out by painting over the black chalkboard paint with a coat of Miss Mustard Seed milk paint in Shutter Grey. Then I used some Homestead House Salad Bowl Finish to create a resist (read more about that technique here) and then added two coats of Homestead House milk paint in Raw Silk which is a white with a grey undertone. Once the paint was thoroughly dry, I added the transfer following the directions provided in the packaging. After the transfer was in place, I sanded it very lightly with 220 grit sandpaper and then added a top coat of Miss Mustard Seed’s Furniture Wax. The transfer was the perfect size for my ironing board. I set up a little laundry folding scene against the designated blank wall in my piano room. 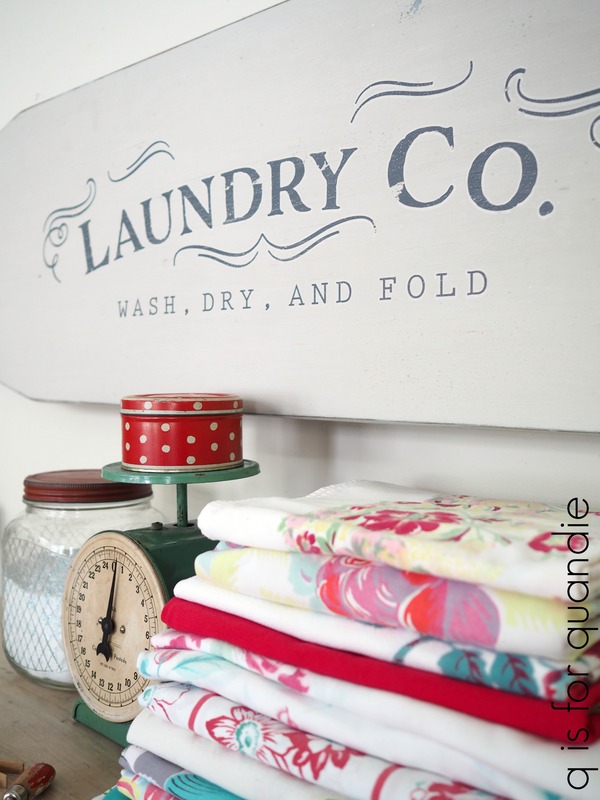 Some bloggers might have been able to stage a laundry sign in their fabulous, light filled laundry rooms. Not me. My laundry facilities are in my ancient 100+ year old dark basement complete with damp concrete walls and cobwebs we can’t keep up with. I wish I had a pretty spot like this for folding my laundry down there. Don’t these vintage linens have the most gorgeous colors? 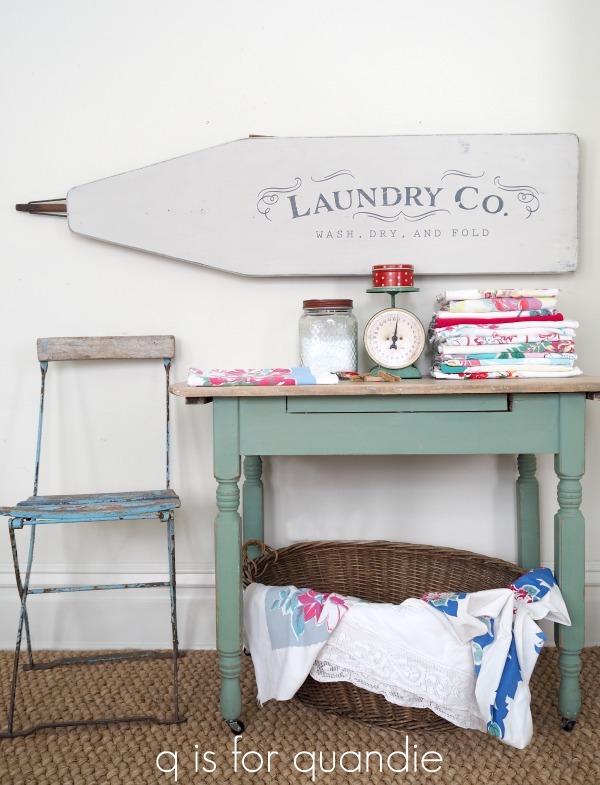 I won’t be hanging on to the laundry co ironing board since I don’t have a spot for it that will do it justice. 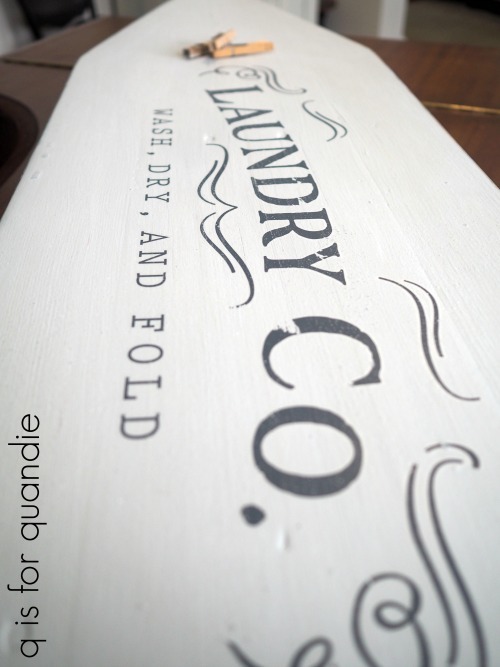 If you’re local and you have a nice blank wall in your laundry room that would be perfect for a vintage ironing board turned sign, be sure to check out my available for local sale page for more details. In the meantime, we’ll be here shoveling out from the storm, watching the rest of Occupied and hoping that spring really is coming this year. Eventually. Next a complete and total fraud. Perfect timing, I bought a wooden ironing board a couple of weekends ago and didn’t know what to do with it. Now I do! I think you had a link in a previous post for purchasing the re.design rub ons, so I need to get on that, thanks for the inspiration. Thanks so much for the link! 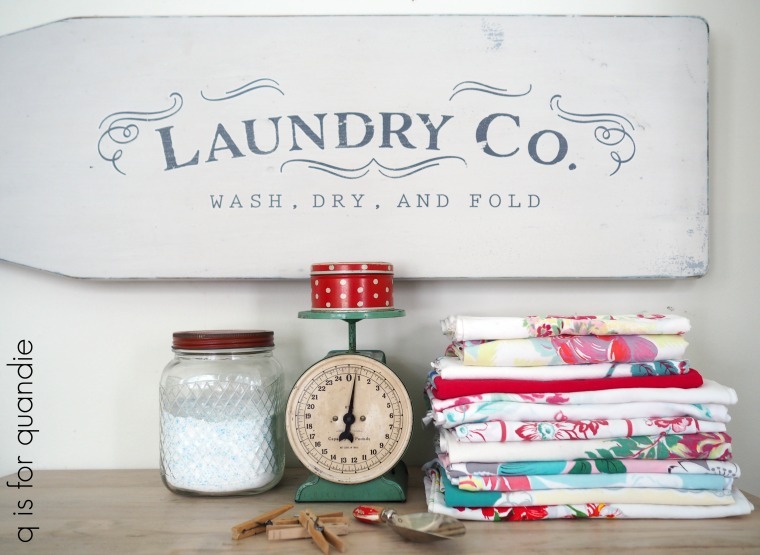 So crazy … I’ve been looking for laundry room stencils with no luck. Time to bite the bullet and try a transfer. Hope your April Snow Showers bring May flowers! Fingers crossed for May flowers! 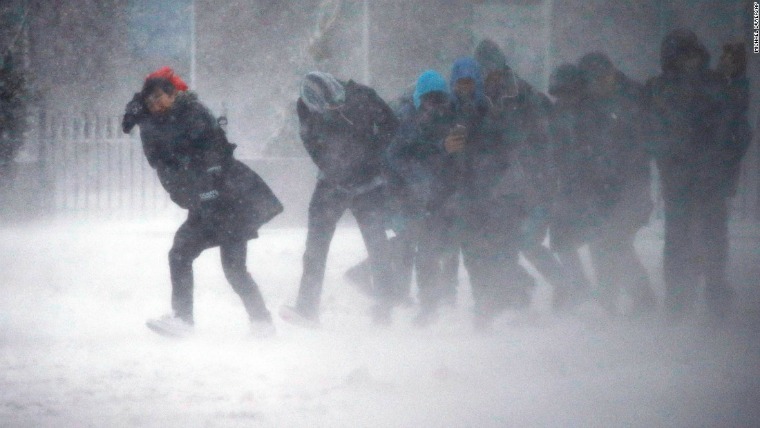 Hopefully, April blizzards won’t bring May lizards or its going to be a weird spring indeed. I hope summer lands on a weekend this year! We loved The Bridge! We’ve watched all 3 versions of it; the American version (U.S./Mexico), the British/French version and the Danish/Swedish version. But we definitely loved the original Danish/Swedish version the most! The ironing board is a great idea…but, like yours, my basement is not deserving of it. I can see it in a first floor laundry room though. Love the color and transfer. So charming! I love the vintage tablecloths, too. 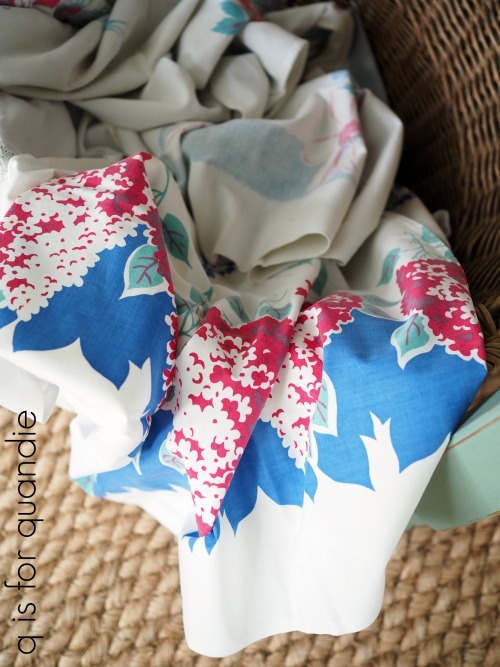 I still grab those tablecloths when I see them at a good price at garage sales, even though obviously I have plenty. They are pretty stacked up in my pantry though. This piece won’t last long as some lucky soul will snag it! It’s so cute! I hope you’re right Ginette! what a brilliant idea! It’s beautiful! I love signs which include unexpected items and this one is a winner! I see these ironing boards at shops/sales and they bring back warm memories but I could never think of a way to use them in my home that didn’t look contrived. Perfect! Thanks Kim! 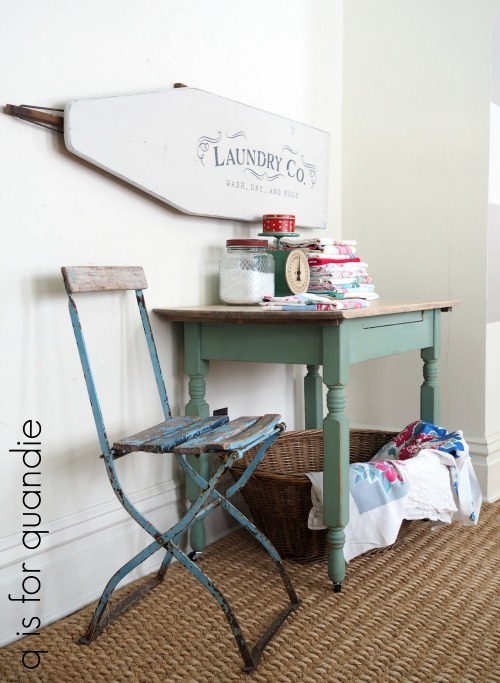 I love finding ways to re-purpose genuine vintage items like this old ironing board. They are so much more charming than the ‘faux’ type things you find at Hobby Lobby or World Market. That is so adorable, I bet you will be making more of those! 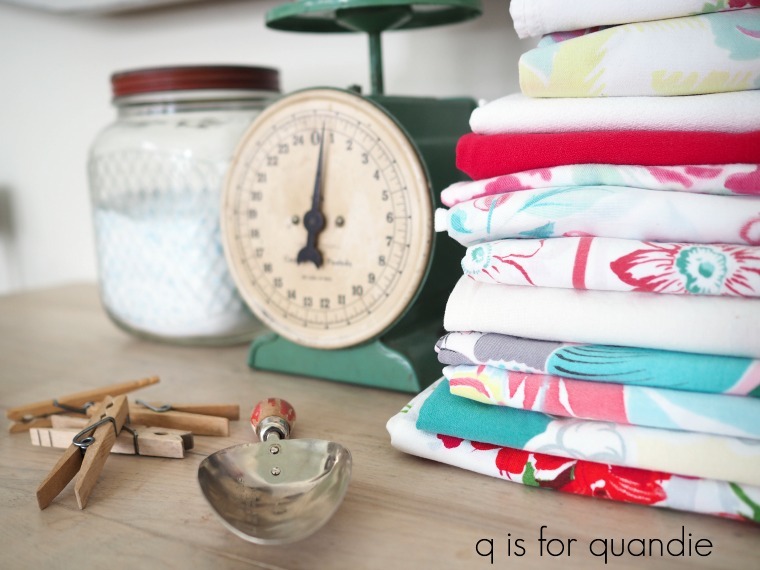 I’ll definitely be keeping an eye out for some more vintage ironing boards this summer at garage sales! Love the ironing board! I just bought that transfer to use on a great old panel I got — I love your ironing board idea though. This will be my first transfer project. Beautiful staging pic, as always…! Thanks Jill! This is a great transfer to choose for your first project. It was super easy to apply. So cute it almost makes doing laundry look like fun, right? Nor is my laundry area worthy of such a cute piece, but I’m sure someone will see this and have the perfect spot. I’ve also used my old ironing board as a handy serving area for bigger parties or on the deck (which I hope, fingers crossed, we Minnesotans can start using again soon)! I did consider using this ironing board as an outdoor server for BBQ’s, but it was a little wobbly. I had visions of all of the food crashing to the ground. A sturdier version would be awesome for that though. And so convenient that you can store it folded up and out of the way and just pull it out for parties. Most newer houses here in Texas have larger laundry rooms cause we don’t have basements! And I forgot to tell you I love your tablecloths. I buy them whoever I can find them, but I sell most of them. I love the new transfers! What a great piece to hang in the laundry room. The new re.design transfers are truly drool worthy! 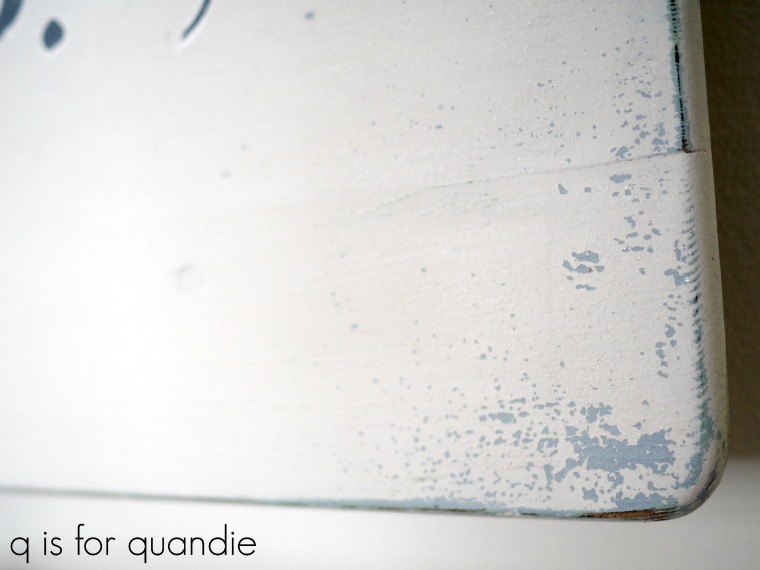 Hey Quandie! Well, we LOVE the “Scandi-noir”, too……Bron was our big fave (we’d say, let’s watch some “Saga” tonight! ), Borderliner (Norwgian) was pretty good, too. Now we’ve just started Occupied (-: I don’t even mind subtitles anymore! Oh,and the ironing board is cool (-: My “winner” package has arrived and I can only say tack so mycket! Thanks Denise! I think we all need to band together and think spring!! Love that! I have a antique ironing board that I also mill painted and couldn’t decide how to repurpose!!! I need to get that transfer! Also—-in live with the color of that little table! Share what color? Definitely get the transfer, it’s the perfect size for ironing boards! As for the color on that table, it was a custom mix using three different milk paint colors and I didn’t keep good track of the exact combination. However, you can read all of the details here. Very nice. I could hang something like that in my laundry room. But it is so white now I think I might need some color.